We all know Irish Whiskey is currently undergoing some sort of resurgence, new distilleries opening here and there in Ireland and many other exciting projects in the pipeline ! 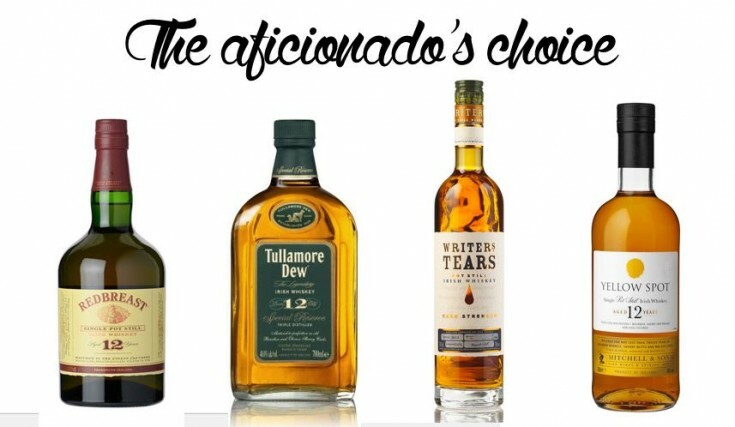 Innovative products, easy-drinking tipples but also incredibly rare and vintage expressions are all part of the rich Irish Whiskey landscape, bringing to your taste buds such a wide choice that you may sometimes not know where to start your journey through the great world of Irish Whiskey. Stop biting your fingernails, I’m here to help ! 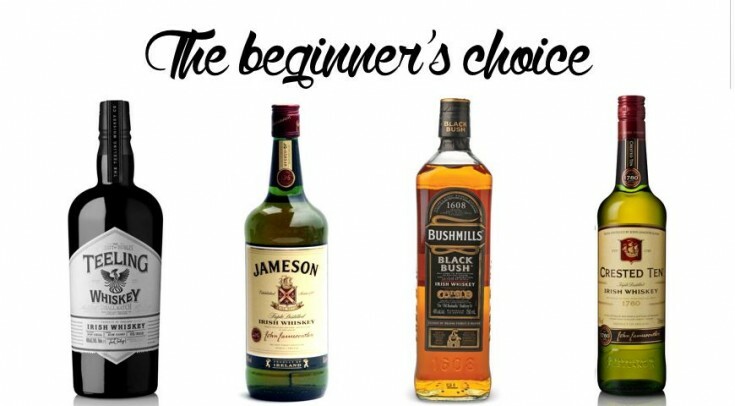 Here’s a quick 3-level guide to help you start your Irish Whiskey Tasting career, starting you off with very approachable – and affordable – (but still oh-so-tasty!) drams and progressively bringing you to more complex and/or hard-to-find beverages (worth the quest !). CLICK ON WHISKY NAMES FOR MORE INFORMATION & TASTING NOTES ! Since Teeling whiskey launched a few years ago, they have being the essence of Irish Whiskey innovation. Teeling Small Batch is typical of how Teeling innovate. A mix of grain and malt would be reminiscent of Black Bush but the Rum Cask maturation and stronger strength make this a completely different whiskey to its Northern cousin. Produced at the Midleton Distillery, Jameson is Ireland’s quintessential Irish blend, a classic. Jim Murray even awarded it an incredible 95 points! Redbreast has become a bench mark for Single Pot Still Irish Whiskey. Often the Master Blender may have chosen whiskeys up to 15 years old, so expect the best! This 12 Year old expression has been matured in bourbon and sherry casks from 12 to 15 years to add real depth and power to the already excellent Tullamore DEW original. The result is one of the smoothest Irish Whiskeys on the market ! Like Green Spot, the 12 Year Old Yellow Spot Single Pot Still Whiskey was produced for Mitchells the Wine Merchants of Kildare Street Dublin and it was delivered from the distillery in the cask to be bottled in Mitchells Shop. In those days, whiskey casks in Mitchells’ bonded warehouses were daubed with a spot of coloured paint to indicate the age. So Blue, Green, Yellow and Red Spots corresponded to 7, 10, 12 and 15 years respectively. Delivery ceased in 1960 but the great news is that Irish Distillers have resurrected this wonderful 12 Year Old Pot Still Whiskey in recent years. In addition to been matured for 12 years in Bourbon and Sherry casks, Yellow Spot is then finished in Malaga Butts to balance the Pot Still Spice with a honeyed sweetness. For over 30 Years, Barry Crockett served as Master Distiller in Midleton Distillery, just as his Father Mr. Max Crockett had done before him. In fact, Barry Crockett was born, grew up and lived in the Master Distillers House in the grounds of the distillery until his retirement two years ago. Barry Crockett Legacy is Barry’s personal selection of Single Pot Still Whiskeys matured in ex Bourbon Barrels with the addition of a Pot Still Distillate which has been matured in virgin oak casks. Greenore Irish Whiskey is a new Single Grain Irish Whiskey which was created by the Cooley whiskey distillery some years ago. Normally single grain whiskey is used for blending with malt or pot still whiskey where it is used to lighten the more robust flavours of pot still derived spirits. 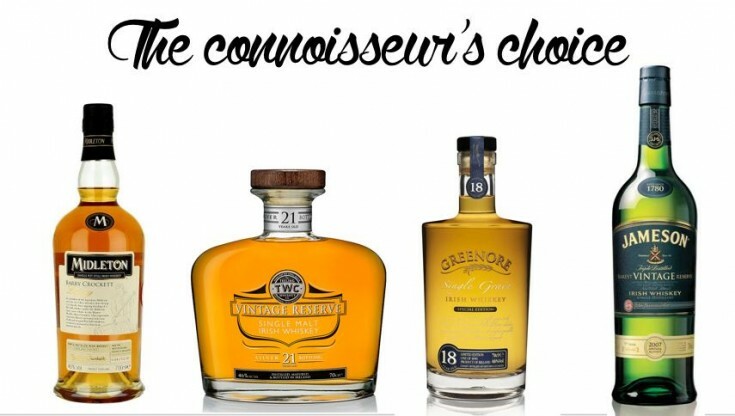 Greenore 18 Year Old Single Grain Irish Whiskey is a classic case of doing simple things very well. Jameson Rarest Vintage Reserve is Jameson’s most exclusive whiskey and is the product of all four Masters in Midleton. Master Distiller Barry Crockett has recently been succeeded by Brian Nation, Master Blender Billy Leighton, Master Cooper Ger Buckley and Master of Maturation Kevin O’Gorman. All of the whiskeys in this wonderful reserve blend are of an advanced age and have been matured in Sherry butts, hand picked second fill bourbon casks and specially commissioned port pipes which were used for the rare pot still element.